Compagnie du Ponant has ordered a new ship, a sister to Le Boreal and L'Austral, from Fincantieri, reports Seatrade Insider. The €100m ship will have 132 cabins and will enter service in June 2013. It will be built at Fincantieri's Ancona yard, just like its two predecessors. The interior designer will again be Philippe Nuel. 'This is for us a new step towards the future, which validates a successful business plan and a successful bet,' commented Jean-Emmanuel Sauvée, general manager of the Marseille-based company today. 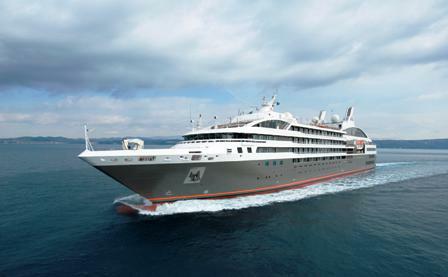 Compagnie du Ponant operates five luxury vessels and is expecting to carry more than 20,000 passengers (including 7,000 French) in 2011 and report an €80m turnover, representing a 40% hike on 2010. One in two passengers this year was new to the company, Sauvée told Seatrade Insider, and one in four was cruising for the first time, he added. In 2012 Ponant hopes to carry 22,000 passengers.